In a surprise move, India’s Censor Board chairman Pahlaj Ninalani has followed instructions from the Ministry of Home Affairs, Government of India, in order to ban the documentary, “En Dino Muzaffarnagar” (Muzaffarnagar Today), inviting ire from well-known human rights advocate in Supreme Court, Prashant Bhushan. Directed by Shubhradeep Chakravorty and Meera Chaudhary, the documentary gives an account of a series of events in Muzaffarnagar between August 18 and September 7, 2013, which led to one of the worst communal riots in Uttar Pradesh. The riots, which erupted in Muzaffarnagar and Shamli districts, led to 52 deaths, and 60,000 people were displaced, and were forced to live 11 relief camps. 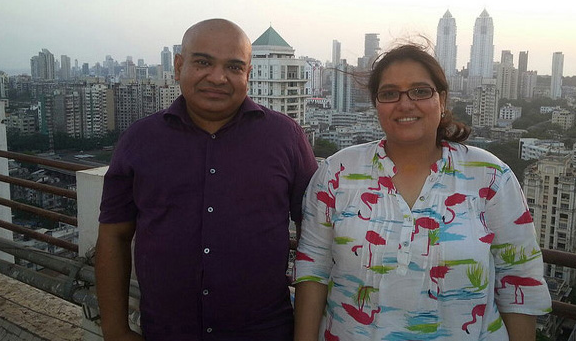 Embroiled in a legal tussle with the Censor Board since 2014, after Chakravarty died that year of brain haemorrhage, his wife Meera Chaudhary moved the Delhi High Court. 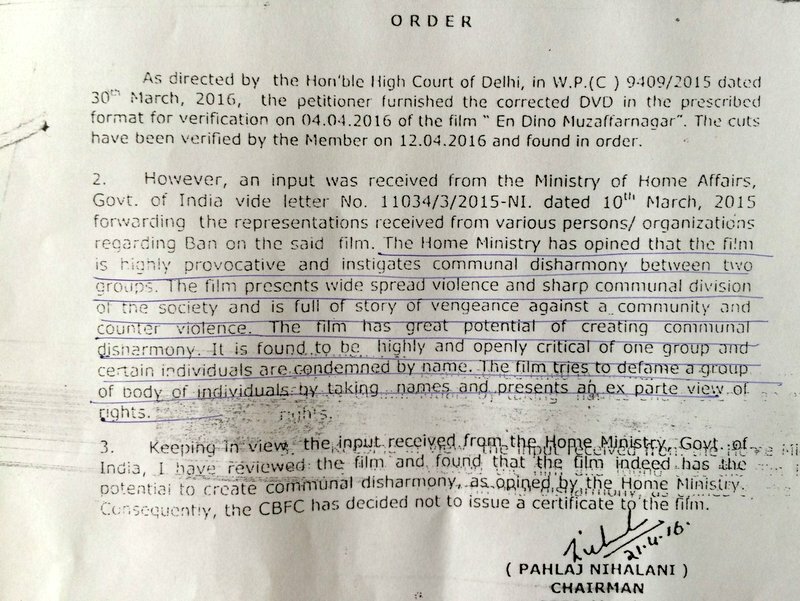 In December that year, the court asked the CBFC to "re-examine" the film and certify it. 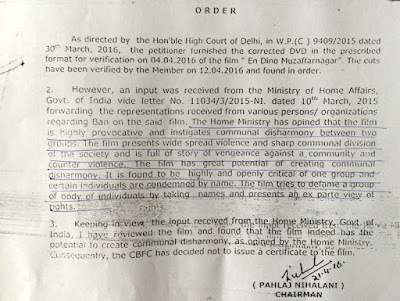 The Censor Board order, a copy of which Bhushan has released along with the tweet, admits that, on April 4, 2016, on directions from the Delhi High Court, "the corrected format" of the film "En dino Muzaffarnagar" was submitted the DVD format to the Censor Board. While the Board "verified" the DVD on April 12, 2016, and it was "found in order", the order said, an “input” was received from the Ministry of Home Affairs, Government of India, along with representations from "various persons/organizations regarding ban on the said film." It relieved, “The film has a great potential of creating communal disharmony. It is found to be highly and openly critical of one group and ertain individuals are condemned by name. The film tries to deface a group of body of individuals by taking names and presents an ex parte view of riots." "Keeping in view the inptut received from the Home Ministry, I have reviewed the film and found that the film indeed has the potential to create communal disharmony, as opined by the Home Ministry. Hence, the CBFC has decided not to issue a certificate to the film", the order, dated April 21, concluded. Makers of “Godhra Tak: The Terror Trai” (2003), which raised heckles of the Vishwa Hindu Parishad, “En Dino Muzaffarnagar” is said to provide a chilling account of how the Sangh Parivar’s pursuit of the “love jihad” strategy for communal polarisation and subsequent mobilization was behind the riots. Zealots are said to have been shown addressing Jat gatherings where there were invocations of “bahu behen beti ki izzat” to instigate the enthralled listeners, with a call for a battle against Muslims to maintain the “purity of the community and its honour”, says a reviewer. “Combine this with growing disenchantment and unemployment among the youth (since jobs are scarce and interest in agriculture is dwindling) and distribution of liquor and cash – and one has a noxious mix”, the reviewer adds.